"It's absolutely unbelievable, isn't it?" Matchup of the Millennium is a program that has an intriguing premise and is executed remarkably well. The idea was to select the best teams from the five decades of the Super Bowl and have them meet in an imagined Millennium Bowl to determine the best Super Bowl team of all time. The four teams are the Green Bay Packers of the 1960s matched up against the San Francisco 49ers of the 1980s and the 1970s Pittsburg Steelers against the Dallas Cowboys of the 1990s. The games are called by Mike Patrick and former NFL quarterback Joe Theisman, with guest appearances by noted NFL Films producer Steve Sabol and, interestingly, legendary sports announcer Howard Cosell. As a longtime Washington Redskin fan, I had to get past my dismay at the snub of my team which has certainly won its share of Super Bowls and probably lost out mainly because all of these teams are stocked with Hall of Famers. The games are rendered remarkably well using a mixture of footage from the renowned NFL films library and the writers have done a good job of creating compelling story lines that survive past the wearing off moment of the novelty format. The narration is reasonably compelling, although all the announcers are all much better at calling real games than "acting" like sports announcers. The Cosell sequences have a few moments of interest but by and large, they fall fairly flat and the interaction between the announcers and Cosell is mostly awkward and less than believable. The game play is actually quite remarkable and quite seamless in its construction of a believable contest from the film clips and computer-generated special effects. There is a certain video game appeal to the entire show and I longed to influence the action somehow. This seems like it could have been a prime candidate for some multi-angle enhancements that would lend itself to being "played" more than once. It is all very realistically portrayed with various football broadcast gimmicks included as well as, sideline reporters, interview segments, along with pregame and post game analysis. This type of disc lends itself to one of the central issues with DVD and that is repeatability. 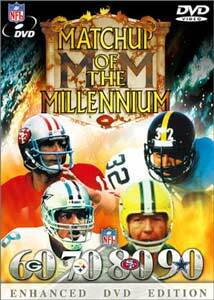 I would love this show in its original realm of television; as a disc, I have to wonder whether I will really ever want to watch it again now that I know who won the "Millennium" bowl. I mean, after all, no matter how compelling the story lines, it is just all made up and features a bunch of rehashed footage from games. It resembles that feeling one gets from having a tape of a game in which the result is already known. Of course, the playing of the game has interest but, a fake game? I don't know. Still, I have to admit I enjoyed watching it and found it a fairly unique bit of entertainment. The next Millennium Bowl will probably benefit from some radical digital enhancement. Image Transfer Review: Multiple film sources are integrated with generally good results and considering the concept, it is very acceptable image quality. NFL Films has been an innovator in stylized sports photography and their style is used to good effect. Good work has been done in bring the old films up to snuff for a DVD presentation. Audio Transfer Review: Nothing very special in the audio category but there is a nice sound design in adding ambient realism to the game action. Some of Cosell edits were clearly audible. Sufficient for the product. Extras Review: No extras on this disc is quite surprising, as it would have seemed to be the perfect opportunity to present more extended information about the teams involved. It would seems that fans of these particular teams would be the most likely customers for a souvenir-type disc like this and stats would definitely lend more to its collectibility. This is not to say that stats freaks are the only demographic of this disc, but y'know? Steeler, Packer, 49er and Cowboy fans will enjoy this one. Others might rather watch with these fans or rent it once. Destined for a cut out bin near you and suitable for birthday giving.